Besides the constant flow of improved chess playing engines, there hasn’t been any really big news on the chess software front in recent years – but that is about to change. The last major news was when Rybka burst onto the scene in December 2005 and since then she has outclassed all other chess engines. Nevertheless, there has been one piece missing from her otherwise perfect world – she hasn’t had her own place to live, so to speak. But now ChessOK (formerly known as Convekta) is preparing to release a new and modern chess GUI that is fit for a champion and will finally make Rybka feel at home, as we learn from an interview with two of the developers, Victor Zakharov and Pete Lupherenko. Victor has been with ChessOK longer than anyone else and is one of the most creative persons in the chess software business. Although Pete had only recently joined ChessOK when this new project started he has been a key contributor to the development of the new GUI. The photo shows a part of the development team that is involved in the project. Q: What is Rybka Aquarium? Victor: It is the start of a long project for creating several types of chess playing user interfaces for different types of devices (Windows, Pocket PC, cell phones and others) and different groups of users (professional and advanced chess players, engine testers, novice users and others). Pete: Rybka is a fish. Everybody (even my cat) knows that fish live in aquariums. Several ideas for a name were discussed, both in the public Rybka forum and in the private beta testers group. Different names were suggested like Poseidon, Neptune and so on, but Aquarium won by a large margin. Victor: The name that the author, IM Vasik Rajlich, selected for his engine “Rybka” means “fish” in most, if not all, Slavic languages. And by the way, the Slavic origin explains why Rybka is referred to as “she”. So it was natural to select a water-related name for the GUI. Pete, Pavel (Aquarium), Ilya (mobile devices, Rybka chess graphics, new GUI for training programs), Volodia (ChessPlanet, Chess School). Aquarium is a common word, known in many languages. It was the code name at the start of the project and it remains so now as well. Pete, not all people know that fish live in aquariums. There are groups of people (possibly named fishermen) who believe that some fish live in rivers and ponds. They even try to catch them to prove their theory. Q: What are your roles in the development of Rybka Aquarium? Victor: I am the coordinator of our company’s software projects. Besides Aquarium they include teaching and training programs, database programs, programs for mobile devices, Internet projects like the chess playing zone, network school and web projects. Q: Why did you decide to develop a new chess GUI? Pete: For me, it was a simple decision. Victor said we needed a new GUI and I decided to agree. 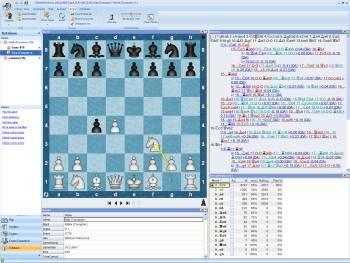 Victor: A GUI for a chess playing program is a logical step in the expansion of the ChessOk product line. It was already on our schedule to develop such a program many years ago, and I want to thank Albert Silver for his help and encouragement at that stage. We made some attempts to enter this market, but we realized that it was impossible without a super strong chess engine. So I am glad that we finally had everything in place to start this big project and show our vision of what a chess playing GUI should look like. Q: Developing a system like Rybka Aquarium is a big project as you say. What is your target group for the first version? Pete: Aquarium is intended to be a ‘GUI for advanced chess/computer chess players’. Beginner chess players (like me, for example) can also have fun with it playing games with material handicaps, or analyzing their own Internet games. But most of the really unique features are targeted towards serious players and/or computer chess adepts. Rybka is the strongest chess engine – head and shoulders above other engines. So she is of special interest to strong chess players. While developing the Chess Assistant database program we had to find a balance between two conflicting objectives – on one hand we wanted to add playing and analysis features to it, but on the other hand we could not implement all of them without making the user interface overly complex and hard to support. We have a wealth of experience in designing game analysis and commenting features and there are many ideas that we would like to implement. Some of them we managed to implemented in Chess Assistant, but most of them have simply waited their time. With Aquarium we are able to offer the users new features that help to make their analysis work more effective and comfortable. Still, there are many ideas waiting to be implemented yet. For this reason we haven’t paid much attention to some other features such as multimedia and 3D display. That will be considered after the first version has been released. Anyway I think that many features of Aquarium are quite interesting for all categories of users. For example exchanging chess information over the Internet. Users will be able to receive commented games from the latest events a few hours after their finish. Another feature that will interest many users is a client for playing on-line games and tournaments. Q: How are you addressing the specific needs of the original target group of serious chess players? Pete: There are a many different “Analysis” options such as infinite analysis, deep analysis, full game analysis and delayed analysis, one of which will almost certainly be suitable no matter what the situation is. The ‘tree’ view is also a powerful instrument for storing and reviewing analysis and for opening preparation. Victor: Aquarium is not just one more GUI for chess players. It has a number of features that automate much of the hard work for you. First of all it offers intelligent analysis. 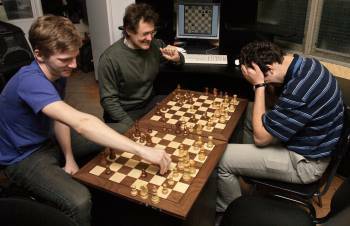 When advanced chess players analyze a position they try many different moves and variations. They evaluate if they are good or bad, search for refutations of some of them and how to improve others. This can be a long and tedious process consisting of many iterations and looking at the same position several times. A GUI is not as smart as a chess master, but it can save many players a lot of work. In Aquarium, analysis is an iterative process. Critical lines are analyzed deeper and more variations are examined. Uninteresting lines are analyzed without much detail. All information is stored for future use. So when a user returns to a position that has already been analyzed, he can see his previous analysis and doesn’t need to repeat it. In the past, chess players often said that “there is no need to run a chess engine more than a minute. It rarely finds anything of interest after a longer time”. Now the situation is different. The more time you give Aquarium and Rybka to work on the position, the more useful information they will deliver. Another strong feature of Aquarium is its wide use of trees. Trees remember information about a position regardless of the move order to get there. So if you annotate a position in the tree pane, the annotations will be available in each game where the same position occurs, regardless of the move sequence used to reach the position. Aquarium will support online access to chess openings, Nalimov tablebases and other Internet services. Web pages using this technology are already available on chessok.com. Q: What about other groups of users? What will the first version have in store for them? Pete: Well, the standard set of chess operations are all included. Database handling, playing against the computer (also with handicaps) and hosting engine-engine matches and tournaments, extensively commenting games and analyzing the puzzle chess position you got from a post in a chess forum – all this is possible. By the way, we have one of the best graphical representations of the board. And you can add various colored arrows, squares, skulls, bells and whistles that can be used to display each side’s game plan, good/bad pieces etc. (and can also make a chessboard look like a carnival in Rio if you overdo it). Victor: One of the features important for people who don’t work with chess software every day is the Chess Resource Server (CRS). CRS allows users to receive updates and exchange chess information between them. Users can upload their files and download files uploaded by other users. The files can contain various types of information. There can be collections of games, analysis results in tree format, configuration files, new board design etc. But one important feature of this server is the ability to automatically install files into Aquarium. Just click on the link and you will have yesterday’s World Championship games commented on your screen. Although Aquarium will be thoroughly tested before it is released, we must accept the fact that no program of this complexity is free from errors. We are interested in hearing about and fixing all program errors. Therefore a special problem reporting system is currently being implemented. If a user runs into a problem he/she can just click the problem report button, mark the problem area on the screen, type in a question and send the report to the support center. Q: What makes this GUI unique compared to older chess GUIs? Pete: Another GUI design approach (we’re using the Fluent GUI design guidelines, which MS Office 07 is also based on). Very advanced “tree” mode. Deep analysis. Full game analysis. Delayed analysis. Score chart. Analysis history, which means that when you run into a position that you’ve analyzed previously, you instantly see the score, depth, time and variation. And the fish on the application button moves its eyes funnily when you move the mouse pointer over it. Victor: In short Aquarium is a clever GUI for a brilliant engine. We have built into Aquarium our knowledge of what the user needs and it knows what engines can do for you and what they can’t do. So Aquarium supports convenient use of engine features and offers additional tools that allow users to perform analysis and other tasks that the engine doesn’t support directly. Deep analysis is one example. Q: Rybka has some specific features such as the Randomizer, Persistent Hash and frequent PV update. Will Aquarium support these features? Pete: At the moment, we treat Rybka just as a regular UCI engine, but it’s going to change in foreseeable future. We have discussed extensions to the interface between Rybka and Aquarium and we’re going to provide some kind of hash table browser. The Randomizer is a very interesting feature that is specific to Rybka and Randomizer support is also planned for Aquarium. The idea is to allow a user to play many games from a single starting position in order to collect statistics about that position. A randomized Rybka will keep track of the previous games and not repeat previous variations, so that a match between two randomized Rybkas will systematically explore variations from the specified starting position. Victor: Surely Aquarium will be well tuned for working with Rybka 3 and will have the ability to use the full power of Rybka. Q: Rybka is also well known for its material handicap play, including several public matches against grandmasters. Will Aquarium address this Rybka specialty? Pete: Yes, you can play at pawn/knight/rook/queen/all minor pieces odds with Rybka within 10 seconds of starting Aquarium. Victor: The number of available handicap configurations is not fixed. New types of material handicaps can be added without changing the program. Users will also be able to view new Rybka-GM handicap matches on-line. Q: FischerRandom chess or Chess960 has been gaining popularity in recent years and Rybka is the current Chess960 world computer chess champion. Will Rybka Aquarium support Chess960? Pete: Yes. You can play Chess960 against Rybka, or play a match between two Chess960-enabled engines. Victor: Good question. I believe that different types of chess variants are important for making chess more interesting and more popular. So Aquarium fully supports Chess960 rules and protocols. We are also considering support for other types of chess games in future versions. Q: Will Aquarium only support Rybka or can you use other chess engines with the program? Pete: Any UCI or Winboard engine can be used with Aquarium. As I stated above, at the moment we treat Rybka in the same way as other UCI engines. Victor: A nice present has been prepared for people who like to install and test tens and even hundreds of chess engines. They will be able to install all engines stored in a specified folder (and its subfolders) automatically as easily as installing just a single engine. Aquarium automatically checks which protocol each engine supports and installs it accordingly (Dann Corbit will immediately recognize this idea if he reads this). A list of all installed engines can be exported and imported. Q: When can we expect the first release of Rybka Aquarium? Relaxing over a game of “pair chess”. It looks like Victor (center) has just tricked Pete (right). Ilya is on the left. Victor: Vas and the ChessOk team pays special attention to quality of future products so the exact date has not been decided, but Rybka 3 and Aquarium will be released at the same time. The product will be released when all features have been carefully tested and polished. I recommend to start checking the news pages at the end of May. Q: Will the Rybka chess engine still be available as a separate product? Victor: Many people have been working with their favorite GUI for many years. We fully understand that migrating to a new GUI will not be easy for some of them, even if a new GUI was better. And I don’t want a situation where our GUI gets an advantage due to some commercial tricks and limitations when the engine is run in other GUIs. Tricks can be good for sales at first, but they will not help to ensure the long term viability of the GUI. Competition should be honest. I believe that people will buy Aquarium as it will really offer some possibilities that other GUIs do not have. So Rybka 3 will be offered in different configurations and with different additional services. One of the options will be the standalone UCI engine. Here I should note that we are trying to build an architecture based on open standards as far as possible. The board graphics, for example, use the open SVG graphics format. Some of the beta testers have already taken advantage of this by drawing their own piece sets and enhancing existing ones (special thanks to Felix Kling for his efforts). We also offer SQL based database access, so for example Microsoft SQL Server can be used for storing and processing Aquarium databases. Q: Will you only have major releases or do you expect some minor releases too? Pete: In a complicated program like Aquarium, it’s hard to eliminate each and every bug, so I’m afraid we’ll have to release some patches afterwards. These will be free, of course. I’m not sure whether we’ll have minor releases (with new features, not fixes) at the moment. We’ll see what the users demand. Victor: There will be frequent updates for the program, databases and additional utilities. The process of upgrading will be quite simple, just enable the program to do it automatically. So every month you may have a better program, more data and better support for your work. Q: Will you offer special upgrade prices to existing users for the major releases? Victor: As for the Rybka 3 engine itself, there will be no discount for it. It is a common practice of many other publishers of chess GUIs and engines. Additionally, the difference between Rybka 2 and Rybka 3 is so huge that it can be considered a completely new product. Q: How will Rybka Aquarium be distributed? Pete: Don’t know either. The beta testers are downloading the GUI via Internet now :) It’s about 50mb though, and the release will ‘weigh’ much more. Victor: There will be a DVD version with huge databases and trees as well as a download version. Q: What will be the main emphasis in the development of Rybka Aquarium after the initial release? Pete: First, we’ll listen to user suggestions/complaints etc. Then, we’ll ignore all of them :) Just kidding. Victor: Yes, we will collect information from the users, discuss their requests and problems, implement requested features and improve the current ones. Some features will be added shortly after the release, but others will wait until the next major version. I want to add that since the early stages of the GUI development we have had great support from a group of beta testers on the Rybka forum. In fact their contribution was not simply beta testing. It was also sharing of their vision on the design and functionality of a chess GUI. I can honestly say that without them Aquarium would not have developed into the product that it is now – a product that everyone involved is rightfully proud of. Very sincere thanks to all Rybka GUI beta testers! Q: Rybka is well known for its lively forum. Will the Rybka forum also be a support forum for the Rybka Aquarium? Victor: Rybkaforum.net is a popular resource already. Vasik Rajlich frequently writes there, so it is the place to hang out if you want to get first hand information about everything related to Rybka. We are also going to offer support for Aquarium on Rybkaforum.net, but in addition we hope to implement features that will help users to publish information from the program on the forum and to import chess related information easier. Q: Finally, what is your favorite feature of Rybka Aquarium? Pete: Did I mention the fish moving its eyes already? :) Playing against Rybka at queen odds. At the moment, the score is about 70% for me. Victor: As a developer Peter uses some hacks, so don’t expect such a high score against Rybka 3 for yourself. As for me the killer features of Aquarium are Deep Analysis and the ability to mark moves in the tree with different colors using hotkeys (Dagh Nielsen, one of the greatest Freestyle players and opening book expert, was instrumental in improving the tree mode). But maybe after polishing the program some other features will become my favorite.